ClaroLux is now offering Controlscape Astro Timers. 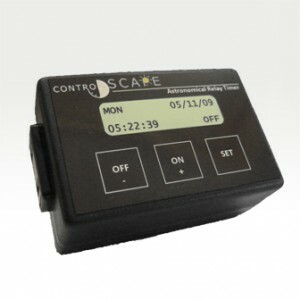 The ControlScape Single Relay Astronomical Timer Module is one of the best astronomical timers on the market today. No longer will you need to use a combination of a photocell and digital timer to have your lighting system accurately turn on at sunset. The ControlScape Astro-Timer knows based on your location exactly when the sun rises and sets. The Controlscape’s astro timer is manufactured with only the best of the best components and is built to outlast any other timer on the market today. The Controlscape Astro-Timer can control any AC powered device up to 15 Amps. It is a great way to put the final touch on your landscape lighting masterpiece. This is a timer that is guaranteed to work night after night with no hiccups. It was designed specifically for the landscape lighting industry. ControlScape uses cutting edge technology to guarantee the daily (and nightly) performance of your installations. Order today and see why this timer is something you will want to use on all of your landscape lighting installations!